Being the leading names in the industry, we are manufacturing an extensive range of Timing Pulley. Used in several industries, our range is widely appreciated by the clients due to its durability, reliability, corrosion resistance and low maintenance, easy installation, excellent performance and dimensional accuracy. Involute offers a range of Classical and HTD “High Torque synchronous drives. The Timing pulleys are available with in pilot bore, finished bore with a keyway or with taper bores suitable for taper-lock bush. The materials used for manufacture are steel, cast iron or aluminum. We offer a comprehensive range of Timing Pulley which is widely appreciated for dimensional accuracy. 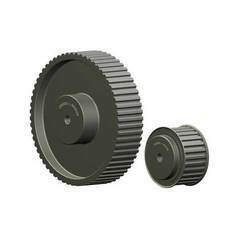 The timing pulleys are manufactured using latest technology and premium quality raw material with quality standards. This allows positive or perfectly synchronous speed drive, along with the flexibility of belt drive. Timing pulleys can be available to suit the client’s requirements.